Manning, G. L. 28 Sept. 1882-23 July 1922 "Father"
Manning, Lee "Mother" 25 Mar. 1885-13 Oct.1918 next to G.L. Marcom, Nancy E. "Mother" 24 Oct.1845-ndd wife of B.L. Mauldin, Lucy A. 6 Mar.1873-3 Aug. 1941 same stone with W.M. Mayes, R.A. 14 Apr. 1850-11 July 1915 next to M.F. Mayes, Ruth Lanell 15 Feb.1919- 18 Mar.1990 next to Wm. McBroom, Otis 17 July 1909-1 Oct.1978 next to Opal. McCollom, John B. 15 Jan. 1874-13 Jan. 1955 "Father"
McLemore, Lucy E. 4 May 1870-- ........ wife of A.L. Medley, Luda 1933 or 1903? Minchey, Charles H. 29 Jan. 1905- "Father"
Mitchell, Nettie Ann 1876-1923 same stone with J.W. 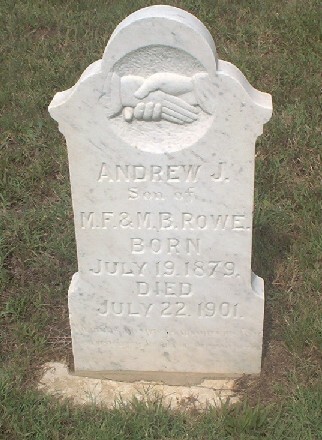 same stone with J.Aubrey Monroe "Brothers"
Moore, C.W. 1844-1927 husb. Of M.F. Moore, Flossie B. 1883-1967 same stone with S.B. Neale, Fannie Braly 29 Jan. 1866-10 June 1946 next to Wm. Neale, Mollie J. 3 June 1864-26 Mar. 1946 next to John H.
Texas Wagoner 57 Field ARTY 19 Div. Nicholson, Miller David 27 Dec.1958-14 Jan. 1986 "Father"
Noble, Lucy Taylor 4 June 1830-24 Feb. 1909 "Mother"
Nolen, Victor H. 10 June 1885-2 Feb.1930 next to Jessie A.
Norman, Paul Allen Jr. 14 Mar.1975-14 Mar.1975 "Son"
Norwood, Lillie M. 1885-1955 same stone with George W.
Nowlin, G.Elton 8 Dec.1908-22 June 1926 I.O.O.F. Nicholson, Miller David 27 Dec.1958-14 Jan.1986 "Father"
O'Dell Ellen 15 Aug. 1878-3 Nov.1960 same stone as J.A. Owens, Frances Adeline 27 July 1854-20 Dec. 1936 wife of W.L. Owens, Inez 25 Nov.1898-6 Aug.1989 wife of Emmett R.
Owens, T.G. 9 Jan.1873-3 Jan.1905 WOW Oakleaf Camp. No. 396 Leonard, Tex. Painter, Bettie Felmet 9 June 1882-28 May 1961 same stone with Wm. unmarked grave next to it. Peak, Jack D. 24 July 1924-25 May 1967 CM SGR next to Nelda J. Peek, Ola Lillian 1912-ndd same stone with Fred. Pemberton, Bessie Angel 5 May 1916- next to John H.
24 Nov. 1912-1 Nov. 1990 "Our Children: John H.Jr., Bobby, Bette"
Pemberton,.Shawn 8 Mar. 1957 "Our sons Kelly , Kelby"
Phillips, Parlie Smith 2 Jan.1874-16 Jan.1904 wife of E.L.
Prather, Elbert d. age 60 on 9 Dec.2001 in Collin co. Ransom, Dorothy M. 4 Dec. 1940-10 Feb.1989 "Evangelist"
"her children: Lynn T., Arthur D., Marilyn A. " Reed, Tennie 15 Nov. 1852-25 Dec. 1938 next to J.M. Renolds, Robert Clyde 11 Dec.1901-24 Mar. 1972 next to Grace P.
Riddle, Mary C. 25 July 1837-24 Sept. 1910 next to John R.
Roach, Alice M. 30 July 1872-22 Oct.1956 wife of James M.
Robertson, Virginia E. 21 Feb.1883-28 Aug. 1884 dau. of J.H.& V.F. Robinson, Thomas E. "Father" 1835-5 July 1896 next to M.C. Rogers, Geneva 1914- same stone with R.C. Rushing, Emma 14 Feb.1895-25 Sept. 1989 "Children: Vida ,Ray, John D. "
Sadler, Adilene 1872-1942 same stone with W.H. Sadler, Calvin T. 1886-1957 same stone with Mable C.
Sagely, Octavia Wiley 6 Feb.1916-3 Mar.1998 "GrandPa""Father"
Saunders, Addie Mullendore 1883-1955 "Mother"
Savage, W.H. 17 Apr.1833-15 Dec. 1909 next to Mary F.
Simmons, Dove Mae 1903-1995 same stone with John B.
Simpson, Katie M. "his wife" 22 June 1870-13 Dec. 1939 wife of Sam B.
Simpson, Sam Baker 8 Feb.1910-29 May 1950 TEXAS PVT 3 QM Regt. Simpson, Samuel B. 4 Feb. 1912-16 Apr.1975 "Dad" next to R.L. Smalley, Dollie wife of M.W. 29 Mar.1866-16 Mar.1898 "Mother"
Smith, D.G. 13 Nov.1890-26 Jan.1891 same stone with W.G. Smith, Etta May 1889-1966 next to H.B. Smith, W.G. 14 Dec.1895-15 July 1897 "Baby" next to D.G. Spoon, Harriett L. 1868-1943 same stone with James M.
Stanfield, Hardy Elmer 31 Aug. 1905-13 Sept. 1983 "Father"
Staniel, Zula 1896-1967 same stone with J.E. Steelman, Willie L. Nutt 11 Aug. 1889-21 May 1952 "Mother"
Stone, John A. Jr. 2 Apr.1904-2 June 1905 "sons of John A. Stone"
Stone, Thos. W. 31 Jan. 1875-21 Nov.1897"Church of Christ"
Stone, Tildress Tayes 24 Jan.1907-24 Jan.1907 "sons of John A. Stone"
Stone, W. H. Foster 6 Oct.1905-26 June 1910 "sons of John A. Stone"
Sudderth, Inell 17 July 1916-ndd wife of Joe "
Sudderth, John D. 1925-1951 Mason "Father of Carol & Ted"
Sudderth, Martha 1854-1940 same stone with David G.
Sudderth, Maude A. 1875-1967 next to W.A. Tate, Tommy 31 Mar.1959-8 Nov.1976 "Bubba"
Taylor, Ella 1864-1935 same stone with J.B.
Thornton, Ella May 1909-ndd same stone with W.C."Bill"
Thornton, Tommy Lynn 29 Jan. 1950-14 June 1963 next to Edith and N.P. It reads" Our Children :Aleta, Frankie, Linda"
Trapp, Danny Max Sr. 27 aug. 1940-26 Sept. 1965 "Father"
Trapp, Mary Isabelle Doolin 9 Aug.1902-8 Apr. 1991 "Little Mother"
"sons, Monty James and Mickey Joe"
Walker, Jack P. 30 June 1914-26 Apr. 1950 "Father"
Watson, Elizabeth 28 Feb.1896-14 Aug. 1970 next to J.A. Weaver, Evelyn Bates 30 Aug.1911-6 Dec.1997 "Beloved Teacher"
West, Sarah M. Stone 7 Dec. 1923- ndd wed 14 Aug. 1946 to Thomas. Williams, Lillie M. 28 June 1887-20 Dec.1964 same stone with W.A.E. stone, next to him stone reads "Mother"
Williamson, Lula 11 Mar.1866-13 July 1887 wife of J.P.
Winton, Edwin Hough 1 July 1885-1959 "Father"
Woosley,Betty Lou 20 Oct.1887-26 Mar.1943 next to William "Mother & Father"
Wright, Arthur Scott 1888-1971 son of A.F.& E.W. Texas PFC 6 Marine 2nd Div WWII same stone with Lois A.
Wright, Effie 1876-1960 same stone with T.E. Wright, Flora McTaggart 1842-1933 "Mother"
Buried in Mt.Soprano, Pastum Italy "In Memory"